This week, we'll head downtown to explore recent condo sales at Crystal BLU, located at 21 Balmuto Street near Bay and Bloor. Completed in mid-2010, this building by Bazis International offers a variety of condo amenities such as a party room, media room and fitness centre with, of course, a crystal blue swimming pool. In the past 90 days, four units were reported sold at Crystal BLU, from $590,000 to $860,000 for a 2-BR suite. In this time, seven units were also reported leased, from $1,850 for a 1-BR unit to $3,100 for a 2-BR suite. For more information on condos at Crystal BLU, please click here. Streetcar has just announced a weekly special that will run throughout the summer for Trinity Lofts, located at 2 Eastern Avenue. For more information, call (416) 690-2988 or e-mail info@trinitylofts.ca, or visit www.TrinityLofts.ca. Looking for furniture to spice up your condo space? Massive discounts are being offered on all designer furniture by Design Republic this weekend! Visit www.CarnabyLofts.com for more information! * Incentive is $10,000 worth of furniture on 1-BR and 1+Den suites, and $16,000 off 2-BR and 2+Den suites. This week, we'll head downtown to explore recent condo sales at Malibu at Harbourfront, located at 600 Fleet Street near Bathurst and Lake Shore. Completed in early 2009, this building offers a variety of building amenities such as concierge, a fitness centre, indoor pool and guest suites. In the past 60 days, ten units were reported sold at Malibu, from $210,000 for a Studio unit to $420,000 for a 2-BR suite. In this time, eight units were also reported leased, from $1,100 for a Studio unit to $2,500 for a 2-BR suite. For more information on condos at Malibu at Harbourfront, please click here. 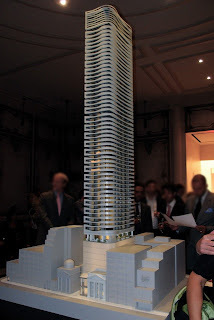 LOVE Condos by Gemterra is ready for construction! A groundbreaking ceremony recently marked the occasion, with the Gemterra Team joined by Mayor Rob Ford, Councillor Norm Kelly, MPP Soo Wong, and P.C. M.P. Jim Karygiannis. We're excited to follow LOVE's progress! Many gathered at Paintbox Condos last week to witness the unveiling of a "fabric narrative" quilt in its new home at the lobby of the condo. The quilt, completed by four exceptional women from the Regent Park Women and Families Quilting Group, took approximately 870 hours and more than 10 months to complete, measuring 90” wide and 77” high. It was designed to capture the essence of Regent Park's rich past and shining future, and tells a revitalization story through a love poem. This celebration marks another step in the revitalization of Regent Park, as the City of Toronto and The Daniels Corporation rebuilds the neighbourhood for 12,500 residents over 15 years. Up to 20 per cent of Sudden Cardiac Arrest occurrences happen in public places; often victims of SCA die before emergency crews can get to them. This week, we'll head west to Etobicoke to explore recent condo sales at the popular NXT at Windermere by Cresford. Located at 103 The Queensway, this condo is only a ten minute drive from Toronto's downtown core and offers a wide variety of building amenities such as indoor and outdoor pools, a fitness centre, tennis court and cinema. Units here range from 462 to 1,144 sq ft. In the past 90 days, four units were reported sold at NXT at Windermere, from $303,000 for a 1-BR unit to $545,000 for a 2+Den suite. In this time, five units were also reported leased, from $1,350 for a 1-BR unit to $2,650 for a 2-BR suite. For more information on condos at NXT at Windermere, please click here. This week, we'll head to Toronto's popular Yonge and Eglinton neighbourhood to explore recent condo sales at 83 Redpath by The Benvenuto Group. Conveniently located at 83 Redpath Avenue just south of Eglinton, this building offers its residents a range of amenities including a yoga studio, outdoor dining and BBQ area as well as a theatre. A quick walk to the TTC Eglinton subway station and the trendy shops and restaurants along Yonge St make this an ideal home for those who lead an active lifestyle. In the past 90 days, three units were reported sold at 83 Redpath, from $312,000 for a 1-BR unit of about 560 sq ft to $410,000 for a 1+Den suite just under 700 sq ft. In this time, three units were also reported leased, from $1,550 for a 1+Den unit to $1,750 for a 1+Den suite. For more information on condos at 83 Redpath, please click here.